Eddie Cantor (circa September 21, 1892 – October 10, 1964), born Edward Israel Iskowitz, was an American "illustrated song" performer, comedian, dancer, singer, actor, and songwriter. Familiar to Broadway, radio, movie, and early television audiences, this "Apostle of Pep" was regarded almost as a family member by millions because his top-rated radio shows revealed intimate stories and amusing anecdotes about his wife Ida and five daughters. Some of his hits include "Makin' Whoopee", "Ida", "Yes! We Have No Bananas", "If You Knew Susie", "Ma! He's Makin' Eyes at Me", "Baby", "Margie", and "How Ya Gonna Keep 'em Down on the Farm (After They've Seen Paree)?" He also wrote a few songs, including "Merrily We Roll Along", the Merrie Melodies Warner Bros. cartoon theme. Cantor was born in New York City, the son of Russian-Jewish immigrants, Meta and Mechel Itzkowitz. The precise date of his birth is unknown. His mother died in childbirth one year after his birth, and his father died of pneumonia when Eddie was two, leaving him to be raised by his grandmother, Esther Kantrowitz. As a child, he attended Surprise Lake Camp. A misunderstanding when his grandmother signed him into school gave him her last name of Kantrowitz (shortened by the clerk to "Kanter"). Esther died on January 29, 1917, two days before Cantor signed a long-term contract with Florenz Ziegfeld, Jr., to appear in his Follies. Cantor had adopted the first name "Eddie" when he met his future wife Ida Tobias in 1913, because she felt that "Izzy" was not the right name for an actor. Cantor and Ida were married in 1914. They had five daughters, Marjorie, Natalie, Edna, Marilyn, and Janet, who provided comic fodder for Cantor's longtime running gag, especially on radio, about his five unmarriageable daughters. Several radio historians, including Gerald Nachman (Raised on Radio), have said that this gag did not always sit well with the girls. Natalie's second husband was the actor Robert Clary and Janet married the actor Roberto Gari. Cantor was the second president of the Screen Actors Guild, serving from 1933 to 1935. He invented the title "The March of Dimes" for the donation campaigns of the National Foundation for Infantile Paralysis, which was organized to combat polio. It was a play on the The March of Time newsreels popular at the time. He began the first campaign on his radio show in January 1938, asking listeners to mail a dime to President Franklin D. Roosevelt. At that time, Roosevelt was the most notable American victim of polio. Other entertainers joined in the appeal via their own shows, and the White House mail room was deluged with 2,680,000 dimes—a large sum at the time. Following the death of their daughter Marjorie at the age of 44, both Eddie and Ida's health declined rapidly. Ida died in August 1962 of "cardiac insufficiency", and Eddie died on October 10, 1964, in Beverly Hills, California, after suffering his second heart attack at age 72. He is interred in Hillside Memorial Park Cemetery in Culver City, California. By his early teens, Cantor began winning talent contests at local theaters and started appearing on stage. One of his earliest paying jobs was doubling as a waiter and performer, singing for tips at Carey Walsh's Coney Island saloon, where a young Jimmy Durante accompanied him on piano. He made his first public appearance in Vaudeville in 1907 at New York's Clinton Music Hall. In 1912, he was the only performer over the age of 20 to appear in Gus Edwards's Kid Kabaret, where he created his first blackface character, "Jefferson". He later toured with Al Lee as the team "Cantor and Lee". Critical praise from that show got the attention of Broadway's top producer, Florenz Ziegfeld, who gave Cantor a spot in the Ziegfeld rooftop post-show, Midnight Frolic (1917). A year later, Cantor made his Broadway debut in the Ziegfeld Follies of 1917. He continued in the Follies until 1927, a period considered the best years of the long-running revue. For several years, Cantor co-starred in an act with pioneer comedian Bert Williams, both appearing in blackface; Cantor played Williams's fresh-talking son. Other co-stars with Cantor during his time in the Follies included Will Rogers, Marilyn Miller, Fanny Brice, and W.C. Fields. He moved on to stardom in book musicals, starting with Kid Boots (1923) and Whoopee! (1928). On tour with Banjo Eyes, he romanced the unknown Jacqueline Susann, who had a small part in the show, and went on to become the best-selling author of Valley of the Dolls. Local radio operators listened to one of the finest programs, yet produced over the radiophone last night. The program of entertainment which included some of the stars of Broadway musical comedy and vaudeville was broadcast from the Newark, N. J. station WDY and the Pittsburgh station KDKA, both of the Westinghouse Electric and Manufacturing Company. The Newark entertainment started at 7 o'clock: a children's half-hour of music and fairy stories; 7:[35? ], Hawaiian airs and violin solo; 8:00, news of the day; and at 8:20, a radio party with nationally known comedians participating; 9:55, Arlington time signals and 10:01, a government weather report. G. E. Nothnagle, who conducts a radiophone station at his home 176 Waldemere Avenue said last night that he was delighted with the program, especially with the numbers sung by Eddie Cantor. The weather conditions are excellent for receiving, he continued, the tone and the quality of the messages was fine. Cantor with Bert Gordon, aka "the Mad Russian". Cantor's appearance with Rudy Vallee on Vallee's The Fleischmann's Yeast Hour on February 5, 1931 led to a four-week tryout with NBC's The Chase and Sanborn Hour. Replacing Maurice Chevalier, who was returning to Paris, Cantor joined Chase and Sanborn on September 13, 1931. This hour-long Sunday evening variety series teamed Cantor with announcer Jimmy Wallington and violinist Dave Rubinoff. The show established Cantor as a leading comedian, and his scriptwriter, David Freedman, as “the Captain of Comedy.” Freedman's team included, among others, Samuel "Doc" Kurtzman, who also wrote for song-and-dance man, Al Jolson, and the comedian Jack Benny. Cantor soon became the world's highest-paid radio star. His shows began with a crowd chanting "We want Can-tor! We want Can-tor! ", a phrase said to have originated in vaudeville, when the audience chanted to chase off an act on the bill before Cantor. Cantor's theme song was his own lyric to the Leo Robin/Richard Whiting song, "One Hour with You". His radio sidekicks included Bert Gordon, (comic Barney Gorodetsky, aka "The Mad Russian") and Harry Parke (better known as "Parkyakarkus"). Cantor also discovered and helped guide the career of singer Dinah Shore, first featuring her on his radio show in 1940, as well as other performers, including Deanna Durbin, Bobby Breen in 1936 and Eddie Fisher in 1949. Indicative of his effect on the mass audience, he agreed in November 1934 to introduce a new song by the songwriters J. Fred Coots and Haven Gillespie that other well-known artists had rejected as being "silly" and "childish". The song, "Santa Claus Is Comin' to Town", immediately had orders for 100,000 copies of sheet music the next day. It sold 400,000 copies by Christmas of that year. His NBC radio show, Time to Smile, was broadcast from 1940 to 1946, followed by his Pabst Blue Ribbon Show from 1946 through 1949. He also served as emcee of The $64 Question during 1949–50, and hosted a weekly disc jockey program for Philip Morris during the 1952–53 season. In addition to film and radio, Cantor recorded for Hit of the Week Records, then again for Columbia, for Banner and Decca and various small labels. His heavy political involvement began early in his career, including his participation in the strike to form Actors Equity in 1919, provoking the anger of father figure and producer, Florenz Ziegfeld. At the 1939 New York World's Fair, Cantor publicly denounced antisemitic radio personality Father Charles Coughlin and was dropped by his sponsor, Camel cigarettes. A year and a half later, his friend Jack Benny was able to get him back on the air. Cantor began making phonograph records in 1917, recording both comedy songs and routines and popular songs of the day, first for Victor, then for Aeoleon-Vocalion, Pathé, and Emerson. From 1921 through 1925, he had an exclusive contract with Columbia Records, returning to Victor for the remainder of the decade. Cantor was one of the era's most successful entertainers, but the 1929 stock market crash took away his multimillionaire status and left him deeply in debt. However, Cantor's relentless attention to his own earnings to avoid the poverty he knew growing up caused him to use his writing talent, quickly building a new bank account with his highly popular, bestselling books of humor and cartoons about his experience, Caught Short! A Saga of Wailing Wall Street  in 1929 "A.C." (After Crash), and Yoo-Hoo, Prosperity! Cantor was also a composer, with his most famous song seldom attributed to him. In 1935, along with Charles Tobias and Murray Mencher, Cantor wrote "Merrily We Roll Along", which he recorded in the 1950s. It was adapted as the themesong for the Merrie Melodies series of animated cartoons, distributed by Warner Brothers Pictures between 1937 and 1964. Cantor himself was frequently caricatured in Warner cartoons of the period, (see Film and television: Animation). Cantor also bounced back between movies and radio. He had previously appeared in a number of short films, performing his Follies songs and comedy routines, and two silent features (Special Delivery and Kid Boots) in the 1920s. He was offered the lead in The Jazz Singer after it was turned down by George Jessel. Cantor also turned the role down (so it went to Al Jolson), but he became a leading Hollywood star in 1930 with the film version of Whoopee!, shot in two-color Technicolor. He continued making films over the next two decades until his last starring role in If You Knew Susie (1948). In the early 1950s, he was one of the alternating hosts of the television show The Colgate Comedy Hour, in which he would introduce variety acts and play comic characters such as "Maxie the Taxi". However, the show landed Cantor in an unlikely controversy when a young Sammy Davis, Jr., appeared as a guest performer. Cantor embraced Davis and mopped Davis's brow with his handkerchief after his performance. When worried sponsors led NBC to threaten cancellation of the show, Cantor's response was to book Davis for two more weeks. Cantor suffered a heart attack following a September 1952 Colgate broadcast, and thereafter, curtailed his appearances until his final program in 1954. In 1955, he appeared in a filmed series for syndication and a year later, appeared in two dramatic roles ("George Has A Birthday", on NBC's Matinee Theatre broadcast in color, and "Sizeman and Son" on CBS' Playhouse 90). He continued to appear as a guest on several shows, and was last seen on the NBC color broadcast of The Future Lies Ahead on January 22, 1960, which also featured Mort Sahl. Eddie Cantor has been portrayed as a recurring character on HBO's series Boardwalk Empire, beginning with the introduction of the show in 2010, where he is played by Stephen DeRosa. Cantor's character appeared in three episodes of the show's first season, one episode of the second season, two of the third. and one of the fourth season. Cantor appears in caricature form in numerous Looney Tunes cartoons produced for Warner Bros., although he was often voiced by an imitator. Beginning with "I Like Mountain Music" (1933), other animated Cantor cameos include "Shuffle Off to Buffalo" (Harman-Ising, 1933) and "Billboard Frolics" (Friz Freleng, 1935). Eddie Cantor is one of the four "down on their luck" stars (along with Bing Crosby, Al Jolson, and Jack Benny) snubbed by Elmer Fudd in "What’s Up, Doc?" (Bob McKimson, 1950). In "Farm Frolics" (Bob Clampett, 1941), a horse, asked by the narrator to "do a canter", promptly launches into a singing, dancing, eye-rolling impression. The Cantor gag that got the most mileage, however, was his oft-repeated wish for a son after five famous daughters. "Slap-Happy Pappy" (Clampett, 1940) features an “Eddie Cackler” rooster that wants a boy, to little avail. Other references can be found in "Baby Bottleneck" (Clampett, 1946) and "Circus Today" (Tex Avery, 1940). In Merrie Melodies, "The Coo-Coo Nut Grove" Cantor's many daughters are referenced by a group of singing quintuplet girls. In "Porky’s Naughty Nephew" (Clampett, 1938) a swimming Cantor gleefully adopts a "buoy". An animated Cantor also appears prominently in Walt Disney's "Mother Goose Goes Hollywood" (Wilfred Jackson, 1938) as Little Jack Horner, who sings "Sing a Song of Sixpence". Cantor's popularity led to merchandising of such products as Eddie Cantor's Tell It to the Judge game from Parker Brothers. In 1933, a set of 12 Eddie Cantor caricatures by Frederick J. Garner was published by Brown and Bigelow. These advertising cards were purchased in bulk as a direct-mail item by such businesses as auto body shops, funeral directors, dental laboratories, and vegetable wholesale dealers. With the full set, companies could mail a single Cantor card each month for a year to their selected special customers as an ongoing promotion. Cantor was often caricatured on the covers of sheet music and in magazines and newspapers. Cantor was depicted as a balloon in the Macy's Thanksgiving Day Parade, one of the very few balloons based on a real person. In addition to Caught Short!, Cantor wrote or co-wrote at least seven other books, including booklets released by the then-fledgling firm of Simon & Schuster, with Cantor’s name on the cover. (Some were "as told to" or written with David Freedman.) Customers paid a dollar and received the booklet with a penny embedded in the hardcover. They sold well, and H. L. Mencken asserted that these books did more to pull America out of the Great Depression than all government measures combined. Cantor was profiled on the program This Is Your Life, in which an unsuspecting person (usually a celebrity) would be surprised on live television by host Ralph Edwards, with a half-hour tribute. Cantor was the only subject who was told of the surprise in advance; he was recovering from a heart attack and it was felt that the shock might harm him. On October 29, 1995, as part of a nationwide celebration of the 75th anniversary of radio, he was posthumously inducted into the Radio Hall of Fame at Chicago's Museum of Broadcasting Communication. In 1953, Warner Bros., in an attempt to duplicate the box-office success of The Jolson Story, filmed a big-budget Technicolor feature film, The Eddie Cantor Story. The film found an audience, but might have done better with someone else in the leading role. Actor Keefe Brasselle played Cantor as a caricature with high-pressure dialogue and bulging eyes wide open; the fact that Brasselle was considerably taller than Cantor did not lend realism, either. Eddie and Ida Cantor were seen in a brief prologue and epilogue set in a projection room, where they are watching Brasselle in action; at the end of the film, Eddie tells Ida, "I never looked better in my life"... and gives the audience a knowing, incredulous look. George Burns, in his memoir All My Best Friends, claimed that Warner Bros. created a miracle producing the movie in that "it made Eddie Cantor's life boring". Something closer to the real Eddie Cantor story is his self-produced 1944 feature Show Business, a valentine to vaudeville and show folks, which was RKO's top-grossing film that year. Probably the best summary of Cantor's career is in one of the Colgate Comedy Hour shows. The Colgate hour was a virtual video autobiography, with Cantor recounting his career, singing his familiar hits, and recreating his singing-waiter days with his old pal Jimmy Durante. This show has been issued on DVD as Eddie Cantor in Person. Cantor appears as a recurring character, played by Stephen DeRosa, on the HBO series Boardwalk Empire. 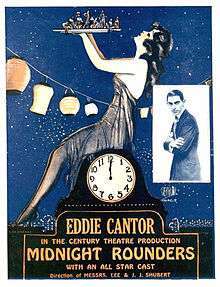 A Few Moments with Eddie Cantor, Star of "Kid Boots" (1923) A six-minute film made in Phonofilm by Lee De Forest featuring Cantor telling monologues and singing two songs. ↑ Obituary Variety, October 14, 1964. ↑ "The Eddie Cantor Story". Eddie Cantor Official Website. Retrieved September 2, 2013. 1 2 3 4 "Eddie Cantor Dead. Comedy Star Was 72. Comedy Star of Vaudeville, Screen, Radio and TV Was a Discoverer of Talent". New York Times. October 11, 1964. Retrieved 2012-08-09. Eddie Cantor, banjo-eyed vaudevillian whose dancing feet and double-takes brought him stardom in movies, radio and television, died of a coronary occlusion today at the age of 72. ↑ "Radio Operators Hear a Good Concert", Bridgeport Telegram, February 4, 1922. ↑ Collins, Ace (5 October 2010). "4 Santa Claus Is Coming to Town". Stories Behind the Greatest Hits of Christmas. Zondervan. p. 224. ISBN 0310327954. Retrieved 20 August 2014. ↑ From "The Warner Bros. Cartoon Companion", E.O. Costello, ed. ↑ New York Daily News (2008-11-28). "Floating back in time with Macy's balloons, 1940, photo No.11". Retrieved 2008-11-28. 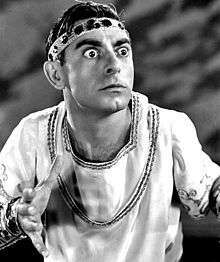 Wikimedia Commons has media related to Eddie Cantor.